After releasing a few teaser videos a few weeks ago, Royal Enfield has finally unveiled the Himalayan at an event held in Delhi today. The launch has been reserved for some other date in the future and the folks at Royal Enfield didn't say much about it. The Royal Enfield Himalayan will start a segment in India which is ready to be tapped. With more and more enthusiasts buying Royal Enfield motorcycles with each passing year, the need of the hour was an affordable 'off-road' adventure motorcycle, and Royal Enfield has given us just that. The bike has been developed from ground zero and doesn't share anything similarity with other Royal Enfield models. In one of the videos, the only Indian to finish the famous Dakar rally, CS Santosh, has expressed his views on the off-road capabilities of this bike, and seems quite pleased. The engine of the Royal Enfield Himalayan is a 411cc unit, single-cylinder, air-cooled mill with overhead cams producing 24.5bhp at 6,500rpm and 32Nm at 4,000-4,500rpm. The bike has a kerb weight of 182kgs and ground clearance of 220mm. The fuel tank capacity is a not-so-much 15 litres though. Going the old school way, Royal Enfield has decided to use a carburettor in the Himalayan. There are two 41mm forks at the front and a monoshock at the rear with a travel of 180mm. To make the Himalayan more versatile, Royal Enfield has given a 21" front wheel and a 17" wheel at the rear. Also Read: Will Himalayan Help Royal Enfield Grow More in 2016? Another blog, which was written by Eicher Motor's MD and CEO - Siddhartha Lal, also has some interesting facts. One such fact is that the service interval of the Royal Enfield Himalayan is 10,000kms. 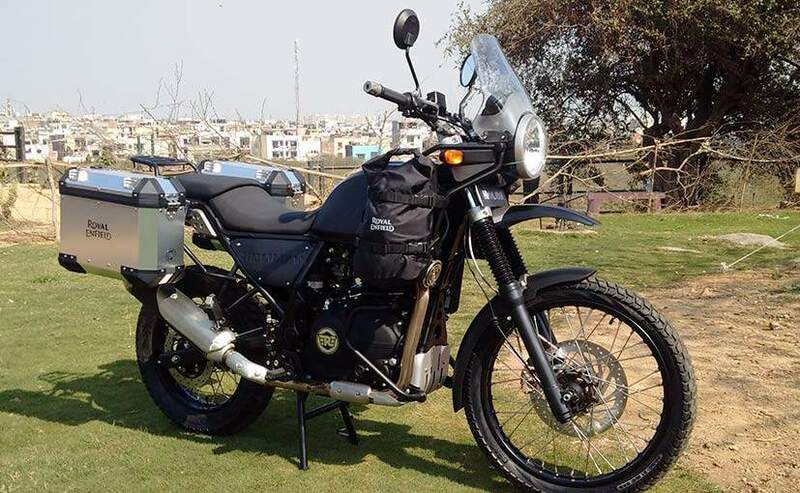 This will add more value to the 'adventure tourer' image Himalayan that the carries. Even though there has been no confirmation from Royal Enfield about the price of the Himalayan, the bike is expected to be priced around ₹ 1.8 lakh.